A Scottish conservation success story is providing the foundations for a ground-breaking project to bring one of the country’s most elusive native creatures back from the brink of extinction in Wales. The charismatic pine marten, once one of the UK’s most rapidly declining species, is today becoming an increasingly common sight across Scotland thanks to protection measures set up in the 1980s. Its recovery north of the Border is so encouraging that conservationists now plan to capture 40 animals in the Highlands and release them in specially selected forests in Powys and Ceredigion. The last definitive sighting of a pine marten in Wales was a roadkill victim found in 2012. The mammal is so rare that experts are unable to estimate how many remain. Loss of trees, fur hunting and culls by gamekeepers in the early 1900s have been blamed for their decline. Now conservationists from Vincent Wildlife Trust (VWT) hope introducing animals from Scotland will kick-start a recovery. Lizzie Croose, VWT’s mustelid conservation officer, said: “There are already some pine martens in Wales but the population has fallen so low there is no chance of it recovering. “There is really strong evidence that if we don’t do anything the population will just dwindle and vanish for ever. “We are moving animals from Scotland to provide a boost to numbers and genetic diversity. 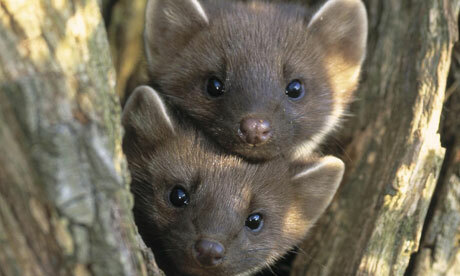 Scotland is in the fortunate position of having a very healthy pine marten population that is doing very well. VWT is working closely with government nature agency Scottish Natural Heritage (SNH), which is considering an application for a licence allowing the protected animals to be captured and relocated. The project, which will cost £1.2 million over six years, will see the first animals being rounded up in September or October, once the breeding season is over. The animals will be fitted with radio collars to allow the team to monitor their spread. The pine marten is native to the UK and Ireland. It is a member of the mustelid family, with relatives including the polecat, weasel, stoat and otter. Present since the last ice age 10,000 years ago, adult pine marten numbers in Scotland are currently estimated between 2,600 and 3,500. The pine marten is similar in size to a small domestic cat, with a slim body, brown fur and a distinctive cream or yellowish “bib” on its throat. It has a long bushy tail and rounded ears. It is a solitary and mostly nocturnal creature that usually lives in woodland. Mating takes place in July and August, with up to five kits being born the following spring. Young stay with their mother until autumn, but males take no part in rearing offspring. They are omnivores, eating whatever is plentiful.